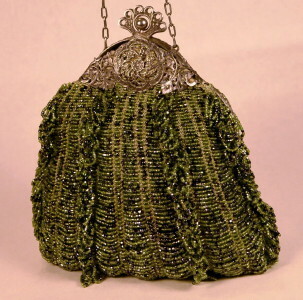 1920's vintage flapper evening handbag. Green with gunmetal gray glass beads. Overall waterfall motif beading with vertical bands of bead loops on green crochet body. Antiqued silver metal chain handle and filigree frame. Push ball clasp into crown frame closure. Moss green silk crepe lining. Gorgeous evening bag in immaculate condition. Frame opening - 5" X 5"